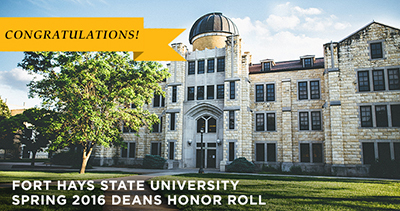 HAYS, Kan. -- Deans at Fort Hays State University have named 1,341 students to the Deans Honor Roll for the spring 2016 semester. Students are listed alphabetically by county and city, state and city, or country and city with their classifications and, for those who have declared them, majors.  Students without a classification are students seeking a second degree or are students who, though full time, are not seeking a degree. Garnett: Trisha R. Wills is a senior majoring in early childhood unified. Atchison: Joseph Dean Schmidt is a sophomore majoring in education. Jill Renae Zink is a senior majoring in general studies (child development). Kiowa: Kay-Leigh Ann Myers is a sophomore majoring in education. Claflin: Peyton D. Broeker is a sophomore majoring in communication sciences and disorders. Kori D. Hammeke is a senior majoring in psychology. Katie Lynn Hipp is a junior majoring in communication sciences and disorders. Aubrey Lynn Kempke is a senior majoring in accounting (public). Kevin William Klug is a senior majoring in biology (pre-medical and pre-dentistry). Ruth Anne Potter is a freshman majoring in art (graphic design). Ellinwood: Adaline Marie Billinger is a senior majoring in English (teaching). Kristi Lynn Dewerff is a senior majoring in elementary education. Rachel Marie Doll is a sophomore majoring in health and human performance (K-12 teaching and coaching). Tiara M. Espinosa is a senior majoring in music. Great Bend: Luke A. Abbott is a senior majoring in mathematics (teaching). Brandon Michael Ball is a sophomore majoring in technology studies (education). Selam Caren Ball is a sophomore majoring in chemistry (biochemistry). Sabrina Lynn Campbell is a senior majoring in education. Morgan Michele Choitz is a junior majoring in social work. Amy Lynn Christopher is a senior majoring in radiologic technology. Mary Katharine Doyle is a senior majoring in general studies (historical). Megan Renee Durland is a sophomore majoring in history (secondary education). Jonathan Robert Emig is a junior majoring in biology (cellular-molecular). Holly Ann Foster is a junior majoring in political science. Kelly Jo Hart is majoring in education. Joshua Wayne Holuska is a junior majoring in information networking and telecommunications (computer networking). Jordan B. Klima is a senior majoring in finance (financial planning). Ashley Victoria Lockwood is a junior majoring in psychology. Dawn Marie Martin is a senior majoring in education. Alexander James Moyers is majoring in education. Krista Deann Palmer is a senior majoring in psychology. Emilie Renee' Regier is a sophomore majoring in nursing. Elizabeth A. Swigart is a senior majoring in social work. Alexis Taryn Werth is a junior majoring in nursing. Lauren Elizabeth Wiebe is a senior majoring in social work. Ashley Denise Wieland is a senior majoring in justice studies. Hoisington: Robyn Nichole Ashauer is a senior majoring in social work. Cara Lynn Kaiser is a junior majoring in social work. Matraca Lane Ochs is a senior majoring in English (literature). Andrea B. Willesden is majoring in elementary education. Odin: Kami Danae Maxwell is a junior majoring in psychology. Hiawatha: Ariel Nicole Blanton is a senior majoring in psychology. Fenwicht Faust Edwardson is a sophomore. Andover: Ben Elliott is a junior majoring in organizational leadership. Jennifer Lester is majoring in elementary education. Rebecca Taylor Stevenson is a senior majoring in education. Augusta: Laci Lea Carsten is a junior majoring in education. Elizabeth Lee Haury is a senior majoring in history (secondary education). Trent Cameron Lockamy is a senior majoring in information networking and telecommunications (computer networking). Bailey Lane Ritchey is a junior majoring in general studies. Heather Renee Spyres is a junior majoring in information networking and telecommunications (Web development). Gabriel Nicole Swartz is a freshman majoring in biology (pre-physical therapy). Alexandra M. Taylor is majoring in elementary education. Shai Tesh Winzer is a senior majoring in art (studio art). El Dorado: Rebekah Lynne Prichard is a senior majoring in general studies (education). Kaylie Elizabeth Towles is a senior majoring in organizational leadership. Towanda: Mary Lynne Luebbert is a sophomore majoring in organizational leadership. Amy Marie Varner is a senior majoring in agricultural business. Whitewater: Braden Ray Allmond is a freshman. Ashley Nicole Bain is a junior majoring in marketing. Cottonwood Falls: Rebecca Louise Turner is majoring in early childhood unified. Cedar Vale: Aspen Daniell Haden is a senior majoring in education. Sedan: Teresa Faye Jackson is a junior majoring in organizational leadership. Galena: Doris L. Adams-Scott is a senior majoring in management. St. Francis: Shayla Jean Hilt is a senior majoring in social work. Ashlee Nicole Orth is a sophomore majoring in education. Ashland: Giles Francis Fox is a senior majoring in physics. Kayla Michele Lay is a junior majoring in tourism and hospitality management. Amira Celeste Elzinga is a sophomore majoring in radiologic technology. Katelyn Maxine Folks is a junior majoring in nursing. Amy L. Hammel is a sophomore majoring in general studies (massage). Tori Irene Ihnen is a sophomore majoring in English. Wakefield: Emilie Catherine Pearson is a freshman majoring in nursing. Aurora: Allissa L. Kearn is a senior majoring in elementary education. Clyde: Rachel Rae Hambleton is majoring in elementary education. Kaylee Gail Mosher is a senior majoring in elementary education. Concordia: Emily Anne Brown is a junior majoring in elementary education. Paige Nichol Evans is a senior majoring in biology (pre-medical and pre-dentistry). Jordynn Elise Gumm is a junior majoring in elementary education. Amanda Louise Lawrence is a junior majoring in general studies (education). Makayla Rae Nelson is a junior majoring in accounting. Joshua D. Pounds is a senior majoring in technology studies (industrial). Kayla Ann Sicard is a senior majoring in marketing. Zoe Lyn Walsh is a sophomore majoring in management (human resource). Burlington: Peyton Darbi Suter is a junior majoring in communication sciences and disorders. Coldwater: Brena Helene Alexander is a senior majoring in health and human performance (K-12 teaching and coaching). Abby Leigh Gales is a sophomore majoring in health and human performance (sport and exercise therapy). Jera Anne Gales is a senior majoring in English (teaching). Wilmore: Brenna L. Lawless is a freshman majoring in biology (wildlife biology). Arkansas City: Patrick Celestine Burton is a senior majoring in elementary education. Tera Lee Mills is a senior majoring in organizational leadership. Brynn D. Nulik is a senior majoring in psychology. Emily Joy Soule is majoring in elementary education. Rakiyah M. Taylor is a senior majoring in management (human resource). Sarrah Emma Westenfeld is a junior majoring in general studies. Mindy M. Williams is a senior majoring in information networking and telecommunications (Web development). Winfield: Jandi Vaughn Handlin is a senior majoring in general studies (child development). Matthew Wayne McWithey is a senior majoring in finance (economics). Pittsburg: David Robert Blanchard is a freshman majoring in information networking and telecommunications (Web development). Oberlin: Baron Jon Green is a junior majoring in justice studies. Brooklyn Taylor O'Hare is a senior majoring in social work. McKenna Paige O'Hare is a freshman majoring in art. Abilene: Karina Anderson is a junior majoring in nursing. Kellsi Lin Bacon is a junior majoring in early childhood unified. Kiley Michelle Crider is a junior majoring in health and human performance (K-12 teaching and coaching). Brittany Marie Duer is a sophomore majoring in agriculture (agronomy). Tara Lynn Hoekman is a senior majoring in nursing. Brandon Lee Jones is a freshman majoring in music (music education). Megan Marie Keller is a sophomore majoring in education. Jenna Ann Klein is a freshman majoring in biology (pre-medical and pre-dentistry). Stefanie Renee Laudick is a senior majoring in nursing. Chapman: Kaylen Deanne Gugler is a sophomore majoring in agriculture. Lindsey Beth Hurford is a sophomore majoring in biology (pre-medical and pre-dentistry). Dana Obermeyer is a junior majoring in general studies. Ellsworth: Jessica Leigh Stookey is a freshman majoring in nursing. Enterprise: Derek James Bartlett-Steede is a freshman majoring in physics. Christian Edward Meuli is a junior majoring in mathematics. Thomas Gene Meuli is a freshman majoring in athletic training. Herington: Cara Meyer is a senior majoring in art (graphic design). Solomon: Laura Elizabeth Edwards is a senior majoring in social work. Woodbine: Rowe A. Hinkle is a senior majoring in history (secondary education). Highland: Brittany Ilece Rauch is a senior majoring in marketing. Jessica Faye Rauch is a senior majoring in art (graphic design). Troy: Cleave Felicia Van is a senior majoring in agriculture (animal science). Baldwin City: Brittnay Taryn George is a junior majoring in nursing. Andrew Todd Morgan is a junior majoring in sociology. Elizabeth Jerre Sigvaldson is a senior majoring in justice studies. Eudora: Nicholas Steven Cole is a senior majoring in political science. Lisa Jane Moffitt is a senior majoring in education. Lawrence: Brandon Scott Daley is majoring in elementary education. Rachel Quillen Eichhorn is a senior majoring in health and human performance (gerontology). Prerona Kundu is a sophomore. David Mitchell Massey is a sophomore majoring in computer science. Ashley Louise Monroe is a junior majoring in psychology. Amanda Morgan is a sophomore majoring in communication sciences and disorders. Sophia Palmer is a freshman majoring in psychology. Abigail Marie Schmidtberger is a sophomore majoring in biology (cellular-molecular). Lecompton: Julie Denise Clement is a junior majoring in history. Kinsley: Tiara Lamay Bollig is a freshman majoring in English (writing). Krysten Nicole Brake is a senior majoring in chemistry (forensic science). Lewis: Alma Joselin Marrufo-Armendariz is a senior majoring in social work. Daniel A. Saenz is a freshman majoring in political science. Catherine: Kyle M. Schmidt is majoring in information networking and telecommunications (computer networking). Ellis: Abigail L. Hafliger is a sophomore majoring in communication sciences and disorders. Sarah Rosalee Henman is a freshman. Heather Ann Hollingshead is a senior majoring in early childhood unified. Shelby Lynn Jacques is a senior majoring in accounting (public). Jacob Daniel Kinderknecht is a senior majoring in health and human performance (K-12 teaching and coaching). Breanna Ashley Kroeger is a senior majoring in art (graphic design). Alondra Meraz is a senior majoring in nursing. Jared Scott Mick is a junior majoring in finance. Sarah Jane Mick is a freshman. Ryan M. Pritchett is a freshman majoring in physics. Jensen Nicole Scheele is a senior majoring in athletic training. Matthew R. Spurlock is a senior majoring in English (teaching). Tyler Gary Walters is a junior majoring in physics. Brianna L. Witchey is a sophomore majoring in sociology. Olivia Anne Zody is a senior majoring in elementary education. Hays: Jaylen Renae Adams is a sophomore majoring in organizational leadership. Mackenzie Rose Albers is a senior majoring in marketing. Bader Ahmad Alshammari is a junior majoring in information networking and telecommunications (computer networking). Lizette Avalos is a senior majoring in organizational leadership. Jessica Renae Babyak is a freshman majoring in biology (pre-occupational therapy). Madison Rhea Bainter is a junior majoring in justice studies. Jennafer D. Ball is a senior majoring in general science. Brooks David Barber is a freshman majoring in marketing. Michael A. Barker is a junior majoring in accounting (public). Taran Nichole Becker is a senior majoring in English (writing). Max Edmund Befort is a sophomore majoring in music (music education). Dina Benitez is a senior majoring in education. Stephanie Jean Beougher is a sophomore majoring in psychology. Breanna Kay Bezona is a senior majoring in health and human performance. Matthew J. Binder is a senior majoring in finance. Zachary D. Binder is a senior majoring in finance. Megan Marie Bird is a junior majoring in psychology. Johnae Erniesha Blackmon is a senior majoring in marketing. Robert West Borthwick is a sophomore majoring in justice studies. Brianna Shae Boyer is a sophomore majoring in social work. Jensen Kahler Boys is a junior majoring in radiologic technology. Macey Marie Brake is a senior majoring in health and human performance (K-12 teaching and coaching). Kylie Shae Brown is a freshman majoring in social work. Rylee Michelle Broyles is a sophomore majoring in justice studies. Timothy Buhlig is a junior majoring in biology (cellular-molecular). Mallory Renee Buresh is a senior majoring in elementary education. Shanna Kay Butel is a senior majoring in elementary education. Ashley Rene Butler is a freshman majoring in education. Tristan Martin Callis is a sophomore majoring in chemistry. Brett Christopher Chrisler is a senior majoring in physics. Armando Correa is a senior majoring in information networking and telecommunications (computer networking). Ashli K. Dinkel is a junior majoring in geography. Mckenna Ann Duffy is a freshman. Holden Eisiminger is a sophomore majoring in physics. Meagan L. Englert is a senior majoring in English (teaching). Ethan Wayne Espinosa is a senior majoring in history (secondary education). Nathan Laine Felton is a senior majoring in psychology. Nicole Elizabeth Feyerherm is a junior majoring in English (writing). Javier Figueroa is a senior majoring in social work. Arianne Lee Fisher is a senior majoring in psychology. Adam Christopher Flax is a freshman majoring in music (music education). Jannik Flores-Panuco is a senior majoring in radiologic technology. Leroy Franco is a sophomore majoring in justice studies. Caleb Joe Garner is a sophomore majoring in sociology. Michelle Lea Geist is a senior majoring in social work. William Shane Goodrow is a junior majoring in computer science. Banner Malea Goolsby is a senior majoring in elementary education. Killian Marcel Gorman is a junior majoring in health and human performance. Heidi Marie Gottschalk is a freshman majoring in accounting. Megan Ann Gottschalk is a junior majoring in medical diagnostic imaging (ultrasound). Chelsea Elaine Greenough is a junior majoring in organizational leadership. Matea Rene Gregg is a freshman majoring in communication (public relations). Kellen Lynn Griffin is a senior majoring in mathematics (teaching). Kirsten Renee Haas is a junior majoring in art. Kori Nicole Haberman is a senior majoring in communication sciences and disorders. Ryan Joseph Hammerschmidt is a sophomore majoring in information systems engineering. Emily Lou Hanson is a senior majoring in elementary education. Trevor Allen Henningsen is a senior majoring in organizational leadership. Becca Rae Herndon is a senior majoring in radiologic technology. Shawn Allen Herrman is a junior majoring in health and human performance (sport and exercise therapy). Bryan Matthew Hirsch is a junior majoring in history (secondary education). Taylor Leigh Hodny is a junior majoring in radiologic technology. Conrad Raymond Hoffman is a sophomore majoring in information systems engineering. Allison E. Hohmann is a junior majoring in education. Amele Reine Hounakey-Akakpo is a sophomore majoring in accounting. Taylor Geneveve Hunt is a senior majoring in philosophy. Gracie Jobeth Jackson is majoring in social work. Haileigh Alexandra Jacobs is a junior majoring in general studies (theatre). Cole Thomas Jacobsen is a freshman majoring in nursing. Elizabeth Marie Jacques is a senior majoring in early childhood unified. Joshua Allen Jecha is a sophomore majoring in information networking and telecommunications (computer networking). Tessa Marie Johnson is a freshman majoring in art. Amy Kathleen Jordan is a junior majoring in psychology. Courtney Rachele Kaba is a senior majoring in biology (pre-medical and pre-dentistry). Nikola Jolanta Kacperska is a senior majoring in political science. Madison Noel Kaus is a junior majoring in communication sciences and disorders. Courtney M. Keener is a junior majoring in social work. Alyssa Grace Keil is a freshman majoring in nursing. Hannah L. Keil is a senior majoring in communication sciences and disorders. Noah Ryon Killip is a senior majoring in health and human performance. Kayla Nicole Kitchen is a senior majoring in radiologic technology. Amber E. Klaus is a freshman majoring in nursing. Morgan A. Klaus is a freshman majoring in nursing. Cody Joseph Kreutzer is a freshman majoring in general studies (theatre). Bethany Ann Kuhn is a freshman majoring in psychology. Michaela Ann Kuhn is a senior majoring in finance (banking). Evan Michael Lane is a junior majoring in health and human performance (exercise science). Courtney Danielle Lawellin is a senior majoring in nursing. Pace L. Leggins is a senior majoring in art (graphic design). Alexyss L. Leiker is a senior majoring in biology (pre-medical and pre-dentistry). Emily Katherine Leiker is a senior majoring in tourism and hospitality management. Stephanie Jo Linenberger is a sophomore majoring in justice studies. Courtney Christine Loftus is a senior majoring in social work. Eli J. Lohrmeyer is a freshman majoring in biology (pre-medical and pre-dentistry). Estefania Lopez-Barrafon is a senior majoring in health and human performance. Paige Lunsford is a senior majoring in health and human performance (sport management). Hailey Marie Mandeville is a junior majoring in psychology. Tara D. Marlett is a senior majoring in social work. Blake Aaron McClung is a sophomore majoring in finance. Lisa Ellen McCormick is a senior majoring in sociology. Marissa Jennine McHugh is a senior majoring in English (writing). Rebecca Renae Meagher is a freshman majoring in psychology. Monica Rose Michaud is a junior majoring in information systems engineering. Aaron Paul Moritz is a senior majoring in technology studies (industrial). Rebekah L. Moritz is a senior majoring in elementary education. Russell James Mortinger is a senior majoring in organizational leadership. Sydney Shae Niernberger is a senior majoring in elementary education. Payton L. Nowlin is a junior majoring in health and human performance (health promotion). Jorge Ramon Olivas-Tena is a senior majoring in geology. Mackenzie Paige Orchard is a senior majoring in justice studies. Aaron Michael Orth is a junior majoring in music (music technology). Taylor Marie Patzner is a senior majoring in social work. Raeanna Jo Peacock is a sophomore majoring in music (music education). Joshua Del Pemberton is a freshman majoring in history. Jarred Alan Penton is a sophomore majoring in physics. Hanna Rae Pfannenstiel is a senior majoring in radiologic technology. Megan Elizabeth Pfannenstiel is a sophomore majoring in art (studio art). Madison Marie Prough is a freshman majoring in education. Kaylie Sue Reeh is a junior majoring in nursing. Daniel Lewis Rineberg is a senior majoring in management. Scott Joseph Ring is a freshman majoring in physics. Justin Paul Roemer is a senior majoring in biology (wildlife biology). Samantha Kate Rohleder is a junior majoring in biology (education). Allison Ann Rome is a freshman majoring in radiologic technology. Monica Catherine Rome is a senior majoring in music (music education). Kenny Allen Rounkles is a junior majoring in radiologic technology. Rylie Nichol Rowland is a sophomore majoring in nursing. Chandler Dalton Rule is a senior majoring in justice studies. Leisha J. Sadler is a junior majoring in biology (botany). Alexis Deann Schaben is a sophomore majoring in communication sciences and disorders. Adam Robert Schibi is a sophomore majoring in accounting (public). Mattison Lynn Schlaefli is a sophomore majoring in biology (pre-medical and pre-dentistry). Caleb Michael Scholz is a junior majoring in technology studies (industrial). Nicholas D. Schumacher is a sophomore majoring in music (theory and composition). Jeanne M. Schwartz is a freshman majoring in art (graphic design). Kiera Nicole Schwarz is a senior majoring in accounting (public). Rebecca Dianne Shinofield is a sophomore majoring in chemistry (biochemistry). Jaici Lynn Simon is a senior majoring in English (teaching). Kyle Joe Sramek is a senior majoring in organizational leadership. Bethany Ellen Staab is a freshman majoring in social work. Tanner J. Staab is a senior majoring in biology (pre-physical therapy). Taylor Marie Staab is a junior majoring in education. Rebecca Lynn Stegman is a freshman majoring in organizational leadership. Kaelea Nikol Stoney is a senior majoring in communication sciences and disorders. Courtney Jo Storer is a senior majoring in radiologic technology. Jeina Suzanne Stoumbaugh is a senior majoring in organizational leadership. Arin Elizabeth Straub is a senior majoring in nursing. Rachel Marie Stritt is a freshman majoring in psychology. Jacob David Stutheit is a junior majoring in history. Alexis Marie Summers is a sophomore majoring in nursing. Kayla D. Swob is a senior majoring in general studies. Jared Alexander Thom is a freshman majoring in health and human performance. Holley Thompson is a senior majoring in communication sciences and disorders. Rebecca Ann Urban is a senior majoring in music. Aaron Joseph Voss is a sophomore majoring in accounting. Taylor Larue Vredenburg is a freshman majoring in English. Aislinn Walters is a junior majoring in music (music education). Joseph Martin Walters is a freshman majoring in technology studies (industrial). Alexis Kay Wasinger is a freshman majoring in communication (public relations). Abby Marie Weaver is a senior majoring in psychology. Jennifer Lynn Weilert is a senior majoring in elementary education. Braiden Joseph Werth is a freshman majoring in biology (pre-medical and pre-dentistry). Hannah Marie Werth is majoring in art. Lakin Marie Werth is a senior majoring in mathematics (teaching). Chelsea Wheeler is a senior majoring in justice studies. Rebecca Rose Whitmer is a senior majoring in elementary education. Jared Wickham is a freshman majoring in information networking and telecommunications (computer networking). Olivia Rose Wiesner is a sophomore majoring in tourism and hospitality management. Jared D. Willhoft is a junior majoring in management. Nikolas F. Wolfe is a freshman majoring in education. Amber Frances Wooldridge is a junior majoring in elementary education. Brianna Marie Wooldridge is a senior majoring in mathematics (teaching). Tyler John Wooldridge is a senior majoring in finance (financial planning). Aubrey Lauren Woolf is a senior majoring in early childhood unified. Lauren Kelsey Wright is a senior majoring in art. Tanner Scott Younie is a senior majoring in political science. Corinne Elizabeth Ziegler is a senior majoring in accounting. Ethan John Ziegler is majoring in agriculture (agronomy). Chelsea Marie Zimmerman is a junior majoring in mathematics (teaching). Chloe Jo Zimmerman is a junior majoring in accounting (public). Drew M. Zimmerman is a senior majoring in biology (cellular-molecular). Schoenchen: Natalie Nicole Bethel is a senior majoring in chemistry. Victoria: Logan Joseph Braun is a freshman majoring in finance. Ashley Marie Dome is a junior majoring in elementary education. Maegan Marie Karlin is a freshman majoring in nursing. Alexyss Jayne Lambert is a freshman. Valerie Renee Lindskog is a junior majoring in education. Zachary Thomas Nelson is majoring in secondary education. Audra Katelynn Nowak is a junior majoring in radiologic technology. Tara Whipple is a junior majoring in health and human performance (sport and exercise therapy). Ellsworth: Haley Nicole Koralek is a junior majoring in social work. Kourtenay Rebecca Sherwood is a senior majoring in education. Wilson: Molly Elizabeth Morgan is a senior majoring in political science. Garden City: Miguel Fernando Alvarez is a senior majoring in social work. Alex Y. Argueta is a senior majoring in radiologic technology. Misael Banderas is a senior majoring in technology studies (construction management). Sara Lynn Bilberry is a freshman majoring in radiologic technology. Lindsay Brooke Bradstreet is a sophomore majoring in radiologic technology. Monserrat Alejandra Feria is a junior majoring in psychology. Amber Lynn Gardner is a senior majoring in communication sciences and disorders. Vanessa Patricia Gaytan is a junior majoring in social work. Melissa Hahn is a senior majoring in elementary education. Thomas Mitchell Hembree is a junior majoring in history. Tristan Robert Lindo is a junior majoring in art. Abel Adrian Medina is a sophomore majoring in psychology. Stephanie Ann Mulligan is a senior majoring in general studies (child development). Kristina Renee Ochoa is a sophomore majoring in accounting (public). Maria Vicente-Ramos is a sophomore majoring in psychology. Dylan Ryan Victor is a sophomore majoring in information networking and telecommunications. Zach Lynn Walker is a senior majoring in English (teaching). Holcomb: Luis A. Salazar is a senior majoring in art (graphic design). Linzie Mekayla Schneider is a senior majoring in social work. Erin M. Sizemore is a freshman majoring in general studies (massage therapy). April Elizabeth Taylor is a junior majoring in elementary education. Chelsea Lynn Wagner is a junior majoring in psychology. Dena L. Walck is a junior majoring in health and human performance. Ariana Elizabeth Wheet is a senior majoring in art. Pierceville: Hazel Marie Elliott is a senior majoring in psychology. Bucklin: Janae E. Price is a sophomore majoring in communication sciences and disorders. Dodge City: Mckayla Dawn Bacon is a junior majoring in education. Cami R. Bates is a senior majoring in justice studies. Brenna Lea Briggs is a senior majoring in elementary education. Natalie Guadalupe Cabello is a senior majoring in psychology. Karina Decasas is a senior majoring in psychology. Samantha Elliott is a senior majoring in psychology. Megan Lee Kerns is majoring in education. Jordan Sierra Koehn is a senior majoring in education. Hannah Elizabeth Mazza is a junior majoring in psychology. Karensa Lee McClure is majoring in sociology. Kayleen Emilie Million is a junior majoring in accounting (public). Layne Austin Moe is a junior majoring in music (performance). Lauren Allene Oldham is a sophomore majoring in communication sciences and disorders. Eva Rodriguez is a senior majoring in elementary education. Armando Rubio is a sophomore majoring in accounting. Maddison Shea Schlegel is a sophomore majoring in biology (pre-physical therapy). Kimber L. Smith is a senior majoring in education. Jacob Charles Thomas is a senior majoring in biology (pre-physical therapy). Ford: Taylor Ann Stout is a senior majoring in athletic training. Spearville: Melissa Dawn Barnett is a senior majoring in elementary education. Wright: Kirsten Ann Theis is a junior majoring in education. Ottawa: Lia Irene Boese is a freshman. Wellsville: Marisa Sue Carman is a freshman. Ashley C. Smith is majoring in elementary education. Junction City: Katie Lynn Cech is a sophomore majoring in organizational leadership. Alicia Antoinette Galvan is a sophomore majoring in justice studies. Gove: Taylor Lynn Tustin is a sophomore majoring in athletic training. Grainfield: Christina Marie Bixenman is a sophomore majoring in communication (public relations). Tuker John Gillespie is a junior majoring in agricultural business. Grinnell: Will Henry Bixenman is a senior majoring in health and human performance (K-12 teaching and coaching). Brooke Elizabeth Ostmeyer is a senior majoring in biology (pre-occupational therapy). Alysia Rose Schwarz is a senior majoring in biology (education). Sharita Marie Schwarz is a junior majoring in nursing. Quinter: Hannah Sue Albin is a junior majoring in education. Stephanie Kay Albin is a senior majoring in early childhood unified. Heather Lynn Kuntz is a senior majoring in art (graphic design). Hayley Kaylen Shoemaker is a senior majoring in music (performance). Blaine Thomas Wertz is a freshman majoring in biology (pre-medical and pre-dentistry). Hill City: Shelby K. Stewart is a senior majoring in organizational leadership. Stephanie Anna Strathman is a senior majoring in radiologic technology. Ulysses: Elpidio Cortez is a junior majoring in accounting. Anna Marie Otter is a sophomore majoring in nursing. Macy Alison Younger is a senior majoring in elementary education. Cimarron: Avery D. Burns is a senior majoring in health and human performance (sport and exercise therapy). Will Allen Pingsterhaus is a senior majoring in mathematics (teaching). Teresa DC Reimer is a sophomore majoring in general studies. Ensign: Melissa Dawn Deaver is a senior majoring in elementary education. Ingalls: Isaac Matthew Baxa is a freshman majoring in geology. Wyatt Allen Poer is a junior majoring in justice studies. Montezuma: Dusty Rae Watkins is a junior majoring in information networking and telecommunications (media studies). Cassy Denae Watson is a sophomore majoring in education. Tribune: Anastasia Rozella Selfridge is majoring in elementary education. Troy Onsby Wineinger is a senior majoring in health and human performance (sport and exercise therapy). Eureka: Renee L. Jones is a junior majoring in elementary education. Syracuse: Chase Ray Keller is a sophomore majoring in agriculture (agronomy). Amy Lynn Norton is a junior majoring in health and human performance (sport and exercise therapy). Anthony: Shawn Daniel Nulik is a freshman majoring in health and human performance (K-12 teaching and coaching). Michael Joseph Stainbrook is a senior majoring in information networking and telecommunications (computer networking). Burrton: Kaetlin Weninger is a junior majoring in nursing. Halstead: Amy Lorraine Hiebert is a senior majoring in education. Hesston: Aaron Grant Billings is majoring in elementary education. Taylor J. Ince is a junior majoring in agricultural business. Elizabeth Faye Reimer is a junior majoring in art (graphic design). Newton: Taylor Christine Burns is a freshman majoring in nursing. Sayra Abigail Porras is a sophomore majoring in social work. Sedgwick: Adrianne Kamille Ferris is a freshman majoring in health and human performance (sport management). Satanta: Daniel Lee Garcia is a senior majoring in general studies (general business). Sublette: Trevor Wayne Leverett is a junior majoring in political science. Jetmore: Ashley A. Frusher is a senior majoring in education. Holton: Jacob Andrews is a freshman. Shellby Ann Dunn is a junior majoring in psychology. Taryn Weilert is a sophomore majoring in chemistry. Hoyt: Thomas Broxterman is a senior majoring in mathematics (teaching). Soldier: Micaela Lynell Keehn is a junior majoring in psychology. McLouth: Travis P. Riley is a sophomore majoring in biology (wildlife biology). Ozawkie: Taylor Insook Willits is a junior majoring in psychology. Perry: Halsten Michelle Coyle is a junior majoring in radiologic technology. Esbon: Chase Michael Wagner is a junior majoring in agricultural business. Formoso: Eric Austin McFarlane is a junior majoring in English (teaching). Fairway: Taylor Ashlyn Kroll is a senior majoring in sociology. Gardner: Rahasya Y. Bharaniah is a freshman. Shawn Henry Hardeman is a junior majoring in justice studies. Sarah Ann Hosterman is a senior majoring in education. Bailey Nell Pfeifer is a senior majoring in social work. Leawood: Jacqueline Marie Dennis is a senior majoring in education. Lenexa: Dawn Kathleen Burnett is a junior majoring in sociology. Christopher Robert Hammond is a junior majoring in psychology. David Isaac Moore is a junior majoring in organizational leadership. Sophia Rose Young is a senior majoring in communication (public relations). Merriam: Toni Lorene Schieber is a senior majoring in management. Mission: Jason Michael Foster is a senior majoring in political science. Olathe: Conner Andrew Erckert is a freshman majoring in justice studies. Aubrey Caitlin McBride is a senior majoring in geology. Todd Joseph McCarthy is a senior majoring in psychology. Alysia Diane Meek is a senior majoring in elementary education. Jessica Lyn Meissner is a senior majoring in elementary education. Jennifer Ogden is a freshman majoring in education. Haydee Polet Reyes is a sophomore majoring in organizational leadership. Amy L. Schneider is a sophomore majoring in communication sciences and disorders. David Lee Schneider is a senior majoring in biology (environmental). Karla L. Trimble is majoring in elementary education. Nicholas A. Varvel is a freshman majoring in biology (wildlife biology). Overland Park: Bobbi Kathryn Caggianelli is a junior majoring in International business and economics. Sara E. Cunningham is a junior majoring in medical diagnostic imaging. Ashley Lynette Feldkamp is a junior majoring in psychology. Jessica Erin Lancaster is a junior majoring in sociology. Alyssa Marie Palmer is a senior majoring in medical diagnostic imaging (ultrasound). Patricia Lea Shields is majoring in elementary education. Darla Jean Wright is a senior majoring in sociology. Roeland Park: Kelsey Renee Gross is a senior majoring in elementary education. Shawnee: Rebecca Lyn Becerra is a senior majoring in psychology. Alexis S. Crispin is a junior majoring in accounting (public). Jill Kathleen Goetsch is majoring in early childhood unified. Chelsea N. Hargrove is majoring in elementary education. Pamela Coralynne Harrison is a sophomore majoring in biology (zoology). Kelsey Marie Kieborz is a senior majoring in elementary education. Rachael Louise Stiles is majoring in elementary education. Hadley Anne Tharp is a senior majoring in justice studies. Hollis Tharp is a freshman majoring in health and human performance. Spring Hill: Lisa M. Lucas is a senior majoring in elementary education. Brett Albert Mesa is majoring in secondary education. Jessica Kate Pollom is a sophomore majoring in communication sciences and disorders. Deerfield: Mollie Elizabeth Calderon is a freshman majoring in health and human performance (sport and exercise therapy). Lakin: Veronica Aparicio is a senior majoring in elementary education. Jordyn Mychelle Crum is a sophomore majoring in nursing. Hunter Ray Kennedy is a freshman majoring in health and human performance (fitness programming). Melissa Rae Williams is a senior majoring in art education. Cunningham: James Dean Fitzsimmons is a junior majoring in agricultural business. Kingman: Jessica Renee Brockleman is a sophomore majoring in education. Bethany Ann Sowers is a senior majoring in nursing. Norwich: Bailey Grace Poe is a junior majoring in accounting. Greensburg: Micah Cole Kendall is a freshman majoring in chemistry. Haviland: Mindy Michelle Alderfer is a senior majoring in elementary education. Brianna Eileen Hays is a senior majoring in nursing. Reagan Layne Jantz is a senior majoring in agriculture (education). Elizabeth Hiebert Penner is a freshman majoring in physics. Oswego: Kandra Donn Smith is a senior majoring in early childhood unified. Parsons: Sami Lee Pontious is a senior majoring in early childhood unified. Kayla Christine Wilson is a junior majoring in management. Dighton: Clayton Salvatore Capra is a senior majoring in music (music education). Healy: Shannon Dee Ballinger is a senior majoring in elementary education. Kiara Chambrie Sharp is a junior majoring in English (writing). Basehor: Jacob David Lutgen is a freshman. Cydney Marie Martin is a sophomore majoring in athletic training. Fort Leavenworth: Staci Bell is a junior majoring in education. Leavenworth: Katelynn Hutabarat is a junior majoring in education. Megan Martindale Rust is a sophomore majoring in organizational leadership. Shyann Rae Winkler is a senior majoring in communication sciences and disorders. Tonganoxie: Mackenzie Lee Cadue is a junior majoring in information networking and telecommunications (Web development). Alissa Ann Donnelly is a junior majoring in accounting. Carissa Lidija Mikesic is a junior majoring in psychology. Lincoln: Kevin Michael Street is a senior majoring in accounting (public). Kyle Jacob Zachgo is a senior majoring in biology (pre-physical therapy). Sylvan Grove: Timothy Kirk Schulteis is a sophomore majoring in agriculture (agronomy). Mound City: Ashton Michelle Schuler is majoring in education. Christina Gail Spencer is a junior majoring in education. Oakley: Faith Marie Charles is a junior majoring in elementary education. Elijah Lee Wininger is a senior majoring in elementary education. Winona: Faith Elizabeth Edwards is a junior majoring in agricultural business. Olpe: Krista Kay Vogts is a sophomore majoring in education. Hillsboro: Jehoiada Daniel Schmidt is a sophomore majoring in biology (wildlife biology). Marion: Elizabeth Nicole Goentzel is a senior majoring in chemistry. Danielle Brooke Litke is a senior majoring in early childhood unified. Beattie: Gayle Cecelia Skalla is a senior majoring in elementary education. Frankfort: Monica Jo Anderson is a senior majoring in psychology. Kelly Ann Horigan is a senior majoring in education. Oketo: Shayla Ann Novak is a sophomore majoring in radiologic technology. Waterville: Megan I. Martin is a senior majoring in general studies (general business). Inman: Oaklee Layne Abernathy is a senior majoring in biology (pre-medical and pre-dentistry). Alyson Renae Gordon is a junior majoring in social work. Lindsborg: Rachel Cora Bellah is a senior majoring in elementary education. Megan Lynn Bergstrom is a junior majoring in agriculture (animal science). Erica Christine Heline is a senior majoring in general studies (child development). Katherine Lee Lambert is a senior majoring in radiologic technology. McPherson: Angela Dawn Givens is majoring in education. Kale Curtis Harrison is a senior majoring in computer science. Blake Addison Huber is a junior majoring in management. Abigail Elizabeth Hughes is a freshman majoring in health and human performance (health promotion). Jeremiah Lee Meeks is majoring in education. Ashley Nicole Plenert is a junior majoring in communication sciences and disorders. Kathleen Cavell Powers is majoring in elementary education. Moundridge: Kodi Lynn Allen is a freshman majoring in art. Fowler: Melanie Jade Espino is a senior majoring in health and human performance (recreation). Hannah Sophia Heinz is a sophomore majoring in biology (pre-physical therapy). Meade: Kaitlin Lee McCammond is a senior majoring in general studies (historical). Fontana: Cassandra M. Olender is a sophomore. Louisburg: Sydney Danielle Dixon is a freshman majoring in medical diagnostic imaging (ultrasound). Beloit: Shannon M. Abram is a junior majoring in elementary education. Emily Rose Brandt is a junior majoring in political science. Stacia M. Martin is a junior majoring in general studies (massage therapy). Arrica Lynn Overmiller is a sophomore majoring in radiologic technology. Cierra Jean Thiessen is a junior majoring in elementary education. Cawker City: Jaden Robert Flower is a sophomore majoring in justice studies. Quintin Hue Silsby is a senior majoring in justice studies. Carridy Jo Storer is a sophomore majoring in education. Hunter: Darci Lea Seehafer is a senior majoring in elementary education. Tipton: Erin Ann Schroeder is a senior majoring in radiologic technology. Independence: Toni Lynn David is a senior majoring in psychology. Council Grove: Colin Gabriel McIver is a junior majoring in management information systems. White City: Ryan Joseph Fairbanks is a senior majoring in nursing. Mindy Morgan Stilwell is a senior majoring in education. Lindsey Sue Wey is a junior majoring in management. Elkhart: Jalen Rose Espinoza is a senior majoring in medical diagnostic imaging (ultrasound). Yessenia Valentina Gonzales is a freshman majoring in education. Oneida: Kaitlyn Folsom is a freshman majoring in biology (pre-medical and pre-dentistry). Seneca: Kayce Lynn Feldkamp is a senior majoring in accounting. Cody Ray Honeyman is a senior majoring in philosophy. Nicole M. Martin is a senior majoring in biology (pre-physical therapy). Chanute: Jena Renee Ray is a senior majoring in elementary education. Tyler D. Stoldt is a junior majoring in organizational leadership. Brownell: Andrew J. Flax is a junior majoring in agricultural business. Ness City: Kaitlyn Dinges is a freshman majoring in agricultural business. Matthew Wade Frank is a junior majoring in accounting. Thomas William Frusher is a junior majoring in agricultural business. Ransom: Lauren T. Sargent is a junior majoring in art. Utica: Elizabeth Devereaux is a sophomore majoring in education. Garrett Matthew Flax is a senior majoring in agriculture (animal science). Almena: Allen Ray Brassfield is a senior majoring in geology. Melissa Mae Hawks is a senior majoring in elementary education. Clayton: Diedre Linn Kramer is a senior majoring in biology (botany). Lenora: Carson Colby Kaiser is a senior majoring in art (graphic design). Kyle Glen Pakkebier is a sophomore majoring in agricultural business. Norton: Jade Oceanna Braun is a senior majoring in social work. Julia Elise Kent is a junior majoring in art. Tina Tanner is a freshman majoring in political science. Jerry Wayne Tolle is a junior majoring in justice studies. Amber Rae Woodyard is a senior majoring in general studies (human services). Carbondale: Haley Elizabeth Gray is a senior majoring in general studies (psychological). Downs: Trystan Blake Schlaefli is a sophomore majoring in biology (pre-physical therapy). Kristin Ann Wagner is a senior majoring in medical diagnostic imaging (ultrasound). Natoma: Danica Lee Casey is a senior majoring in elementary education. Jacob Paulino Chambray is a freshman majoring in organizational leadership. Callie Jo Dunlap is a freshman majoring in education. Corey Jon Dunlap is a senior majoring in health and human performance (K-12 teaching and coaching). Matthew William Macconnell is a freshman majoring in general studies. Tyler Milan Masters is a senior majoring in mathematics (teaching). Bailey Ricole Pfortmiller is a senior majoring in mathematics (teaching). Osborne: Katie Michelle Girard is a senior majoring in elementary education. Caitlyn Nichole Miller is a junior majoring in biology (pre-occupational therapy). Kenton Lee Ubelaker is a sophomore majoring in justice studies. Bennington: Ryein Paige Hensley is a freshman majoring in psychology. Hailee Lynn Schlachter is a senior majoring in elementary education. Dustin Powell Stanley is a freshman majoring in organizational leadership. Madison Dawn Wolf is a senior majoring in marketing. Minneapolis: John Tucker Corman is a senior majoring in history (secondary education). Juan Fernando Delacruz-Martinez is a freshman majoring in applied technology. Bethany Lauren Diercks is a junior majoring in health and human performance (sport and exercise therapy). Erica Lynn Jones is a junior majoring in information networking and telecommunications (media studies). Burdett: Raylinn Grace Nuckolls is a senior majoring in social work. Larned: Alysa Paige Byrum is a freshman majoring in education. Jessica Mick Johnson is a junior majoring in general studies. Alexis Nicole Langdon is a sophomore majoring in education. Christine Renee Orr is a senior majoring in geography. Marley M. Palmer is a sophomore majoring in nursing. Tiffani Lynn Patterson is a junior majoring in justice studies. Larry Deane Peterson is a senior majoring in management information systems. Shyann Dawn Robison is a freshman majoring in education. Hannah Rose Smith is a freshman majoring in general studies (massage therapy). Lauren May Zerr is a sophomore majoring in social work. Rozel: Tristen Kyle Galliart is a senior majoring in organizational leadership. Glade: Kollette Danielle Keeten is a sophomore majoring in art (graphic design). Erika K. Norris is a sophomore majoring in education. Logan: Katie Mae Becker is a senior majoring in psychology. Phillipsburg: Brennan Melvern Engle is majoring in social work. Michaela Lynn Gower is a senior majoring in elementary education. Mindy Lauren Gower is a sophomore majoring in education. Kelly C. Grismore is a senior majoring in management. Bethany Morgan Lennemann is a senior majoring in sociology. Kristin Kathleen Prewitt is majoring in elementary education. Amber Noel Schmid is a senior majoring in elementary education. Sara Lynn Schurz is a senior majoring in biology (wildlife biology). Amy Jean Stapel is a sophomore majoring in radiologic technology. Raegan Leigh Vanderplas is a senior majoring in education. Emmett: Stephani Lynne Robbins is a sophomore majoring in management. Onaga: Abbigail P. Nider is a senior majoring in elementary education. St. George: Levi Shane Anderson is a senior majoring in technology leadership. Wamego: Andrea Birgit Duncan is a junior majoring in marketing. Kelsey M. Peterson is majoring in medical diagnostic imaging (ultrasound). Pratt: Lauren Louise McClain is a junior majoring in management. Hayden Marie Pixler is a junior majoring in general studies (general business). Amanda Renee Wade is a senior majoring in psychology. Atwood: Emily Rose Chessmore is a senior majoring in elementary education. Cheyanne Elizabeth Soderlund is a senior majoring in health and human performance (health promotion). McDonald: Anna-Lura Elizabeth Frisbie is a sophomore majoring in accounting (public). Haven: Kylee Renee Davis is a sophomore majoring in nursing. Hutchinson: Christopher Louis Albert is a senior majoring in history. Melissa Maria Evans is a senior majoring in elementary education. Jessica Reed Hayes is a senior majoring in art. Joshua William Hermes is a junior majoring in music (music education). Diosha Chantelle Johnson is a senior majoring in early childhood unified. Ashlyn Jean Partridge is majoring in elementary education. Vannessa Small is a junior majoring in education. Grace M. Suter is a junior majoring in social work. Kristen Elise Taylor is a junior majoring in early childhood unified. Colton Kristopher Waters is a junior majoring in health and human performance (recreation). Evan Christopher Wondra is a senior majoring in technology studies (industrial). Pretty Prairie: Shanay Darlene Wewe is a sophomore majoring in nursing. South Hutchinson: Sarah Jo Bass is a senior majoring in management. Andrew William Strain is a sophomore majoring in geology. Republic: Brianne M. Little is a sophomore majoring in chemistry. Jarred Michael Stindt is a senior majoring in agriculture (education). Lyons: Matthew Thomas Dewerff is a senior majoring in elementary education. Tiffany Ann Stieben is a senior majoring in management (human resource). Sterling: Alex Lee Burgess is a senior majoring in agriculture (animal science). Hunter Ryan Hewitt is a sophomore majoring in agricultural business. Manhattan: Rounak Bastola is a freshman. Trista Ann Farley is a junior majoring in management. Stefanie Jannee Morris is a senior majoring in general studies (human services). Lee Witt is a senior majoring in International business and economics. Maple Hill: Skyler Allen Markham is a freshman majoring in chemistry. Ogden: Nichole Ashley Smith is majoring in education. Damar: Kiley Paige Marcotte is a junior majoring in elementary education. Plainville: Dalton John Brown is a senior majoring in technology studies (construction management). Brianna Christine Casey is a sophomore majoring in health and human performance. Craig A. Garvert is a freshman majoring in computer science. Taylor Alexandra Hixon is a senior majoring in nursing. Samantha Marie Reif is a junior majoring in health and human performance (sport and exercise therapy). Sara Elizabeth Thummel is a senior majoring in elementary education. Stockton: Ethan Lee Kriley is a senior majoring in technology studies (industrial). Kacey Renee Scott is a senior majoring in political science. Woodston: Colton Downer Hull is a junior majoring in biology (pre-veterinary). Alexander: Katherine Nicole Showalter is a senior majoring in biology (education). Bison: Eleanor Astrid Cornwell is a freshman majoring in art. Matthew Shaun Crotinger is a senior majoring in agriculture (agronomy). La Crosse: Sarah Lynn Holzmeister is a senior majoring in English (writing). Andrew Duane Jay is a sophomore majoring in management. Nicholas Christopher Schmidt is a senior majoring in communication (organizational). Sheldon David Schmidt is a freshman majoring in technology studies (industrial). Kristy Lee Tweed is a senior majoring in chemistry (teacher education). Savanah Lea Woods is a junior majoring in management. Liebenthal: Kelsi Nicole Broadway is a senior majoring in business education (teacher licensure). McCracken: Stephanie Leanne Greenway is a freshman majoring in accounting (public). Otis: Renee Nicole Royer is a junior majoring in radiologic technology. Dalton Wayne Steinert is a junior majoring in accounting. Rush Center: Michaela Marie Jochem is a senior majoring in technology studies. Timken: Kimberly Rose Pechanec is a senior majoring in athletic training. Janel A. Tammen is a senior majoring in agricultural business. Lucas: Troy Lane Bland is a senior majoring in history (secondary education). Braden Scott Schultz is a senior majoring in health and human performance (K-12 teaching and coaching). Brianna Leigh Steinle is a sophomore majoring in communication sciences and disorders. Luray: Angela Page Cotterill is a senior majoring in elementary education. Elaina Renae Haberer is a senior majoring in mathematics (teaching). Garrett Fredrick Keith is a junior majoring in health and human performance (recreation). Russell: Sadie Jo Arnet is a junior majoring in social work. Kenneth Wayne Bangert is a senior majoring in general studies. Carli Ann Denning is a junior majoring in education. Kayla Ann Dewald is a junior majoring in finance. Kari Ann Karst is a senior majoring in elementary education. Hayle Rena Mader is a junior majoring in art (graphic design). Kaci Lynn Nuss is a junior majoring in radiologic technology. Katie E. Reed is a sophomore majoring in nursing. Kayla Renee Schneider is majoring in psychology. Melvin Beryl Williams is a senior majoring in technology studies (industrial). Gypsum: Heather Marie Cleveland is a junior majoring in technology studies (industrial). New Cambria: Jessica Joy Johnson is a freshman majoring in nursing. Salina: Taylor Lynn Albers is a junior majoring in health and human performance (recreation). Miranda Grace Basinger is a sophomore majoring in education. Breeana M. Bohanan is a sophomore majoring in accounting (public). Madison Faye Bryant is a senior majoring in health and human performance (K-12 teaching and coaching). Margaret Rose Burke is a senior majoring in art. Grecia Berenice Castaneda is a senior majoring in social work. Damion Dashon Cooper is a junior majoring in health and human performance (sport management). Aneli Delacruz-Escobedo is a sophomore majoring in nursing. Corey R. Donnelly is a senior majoring in social work. Lindsay Dawn Eitel is a senior majoring in elementary education. Derek Scott Gilbert is a sophomore majoring in business education (corporate communication). Nicholas Michael Grevas is a senior majoring in health and human performance (sport management). Mckenzie Elizabeth Haynes is a senior majoring in elementary education. Kylie Joy Herrington is a senior majoring in English (teaching). William Nigel Isom is a senior majoring in information networking and telecommunications (computer networking). Kurt Jay Lange is a senior majoring in psychology. Jon-Luke Joseph Martin is a junior majoring in music (theory and composition). Tayler Money is a freshman majoring in education. Christopher Joseph Nelson is a junior majoring in education. Michaela Elizabeth Nixon is a junior majoring in education. Clay Jackson Peppiatt is a senior majoring in art (graphic design). Tayler Dawn Pinkall is a senior majoring in health and human performance. Abby Marie Power is a senior majoring in education. Jack justice Rhodes is a junior majoring in management. Channing D. Rutherford is a senior majoring in health and human performance. Morgan Beatrice Soldan is a senior majoring in general studies (education). Laura L. Stegman is a junior majoring in health studies. Shaelin Dawn Sweet is a junior majoring in English (teaching). Noah James Wellbrock-Talley is a sophomore majoring in art education. Hayleigh Williams is a freshman majoring in justice studies. Scott City: Cosme Chavez-Resendiz is a senior majoring in athletic training. Zachery Earl Glass is a sophomore majoring in computer science. Riley Jane Hawker is a sophomore majoring in general studies (massage therapy). Marshal Dale Hutchins is a sophomore majoring in nursing. Elizabeth Paige Irwin is a junior majoring in radiologic technology. Warren Dean Kropp is a junior majoring in biology (pre-physical therapy). Marissa Merae Morris is a sophomore majoring in education. Clay Andrew Mulligan is a senior majoring in biology (pre-physical therapy). Callan Lynn Rice is a senior majoring in early childhood unified. Andrea Teresa Smith is a senior majoring in elementary education. Megan Alexis Thornburg is a sophomore majoring in radiologic technology. Kelly A. Wycoff is a sophomore majoring in health and human performance (sport and exercise therapy). Andale: Courtney Jade Geist is a junior majoring in accounting (public). Tucker Max O'Hair is a senior majoring in biology (education). Bel Aire: Daniel Ibarra is a senior majoring in music. Cheney: Macy M. Becker is a senior majoring in communication (public relations). Amy C. Bergkamp is a sophomore majoring in nursing. Madison Leann Campbell is a junior majoring in biology (pre-medical and pre-dentistry). Dalton Edward Gould is a senior majoring in health and human performance (fitness programming). Mallary Leis is a senior majoring in art (graphic design). Jessica Marie Voss is a junior majoring in art (graphic design). Clearwater: Sue L. Ake is a junior majoring in education. Colwich: Anna Ruth Gerber is a junior majoring in business education (teacher licensure). Amy Smarsh Johnson is a senior majoring in art (graphic design). Ashlynn Belen Sandoval is a senior majoring in elementary education. Stephen Karol Wary is a sophomore majoring in management. Derby: Alexander Ryan Hart is a senior majoring in technology studies (industrial). Carla Marie Miller is a sophomore majoring in biology (pre-occupational therapy). Jaime A. Potts is majoring in elementary education. Alexandrea J. Poynter is a junior majoring in psychology. Broque Pierce Short is a freshman majoring in accounting. Ainsley Katherine Smith is a junior majoring in communication sciences and disorders. Jennifer Lynne Taylor is majoring in early childhood unified. Cassidy Vanness is majoring in elementary education. Drew Vogt is a junior majoring in management information systems. Austin Levi Williams is a junior majoring in radiologic technology. Garden Plain: Julia Marie Gorges is a sophomore majoring in biology (pre-medical and pre-dentistry). Jordan Blaire Klabenes is a senior majoring in elementary education. Adriana Marie Redmon is a sophomore majoring in education. Robert Wilfred Weber is a senior majoring in health and human performance (K-12 teaching and coaching). Goddard: Regan L. Baldwin is majoring in elementary education. Maria Isabel Casenove is a sophomore majoring in art (graphic design). Claudia Lauren Giffin is a junior majoring in psychology. Matthew Allen Layton is a freshman majoring in management information systems. Haysville: Caitlin R. Loffland is a senior majoring in elementary education. Maize: Janette Jolee Dillon is a junior majoring in education. Jessica Denee Lafay is a senior majoring in elementary education. Park City: Kirstan D. Hanson is a senior majoring in art. Caitlin C. Naylor is majoring in elementary education. Valley Center: Sierra Jeanne Archer is a junior majoring in communication sciences and disorders. Jordan L. Bohm is a senior majoring in art (graphic design). Kristy Jo Breneman is a senior majoring in early childhood unified. Cheryl Conrady is a freshman. Chelsea Faith Jackson is a sophomore majoring in health and human performance (health promotion). Viola: Katlyn Marian Pauly is a junior majoring in communication. Wichita: Stefany Marie Amezquita is a sophomore majoring in communication. Regina M. Anderson is a freshman majoring in education. Emily Ann Avila is a senior majoring in early childhood unified. Ian Paul Blankinship is a senior majoring in information networking and telecommunications (Web development). Heath A. Brandyberry is a senior majoring in music (music education). Lorien Kay Buser is a senior majoring in tourism and hospitality management. Abby Caitlynn Cummings is a freshman majoring in psychology. Rakim Armonte Dean is a junior majoring in health and human performance (recreation). Dena Elaine Devereaux is a junior majoring in early childhood unified. Megan A. Dougherty is a sophomore majoring in biology (medical technology). Erin Lin Gaither is a sophomore majoring in accounting. Kelci Marie Glover is a senior majoring in chemistry (biochemistry). Ashley Brooke Golden is a senior majoring in justice studies. Rebecca Marie Gorges is a senior majoring in elementary education. Grant Phillip Gottschalk is a freshman majoring in agricultural business. Steven Lee Grimstead is a senior majoring in management information systems. Collin G. Harrison is a sophomore. Ashlynn Louise Hawk is a senior majoring in elementary education. Nicole Morgan Hernandez is a senior majoring in art education. Brian Edward Hopkins is a junior majoring in sociology. Lindsey Danae Hostetler is a senior majoring in elementary education. Chelsea Ijeoma Iheme is a senior majoring in psychology. Aimee D. Johnson is a freshman. Tyler James Keller is a senior majoring in biology (pre-physical therapy). Daniel Hubert Kelly is a sophomore majoring in health and human performance (sport and exercise therapy). Rebekah Lynn Kivett is a freshman majoring in information networking and telecommunications (Web development). Jacqueline Leo is a junior majoring in nursing. Katrina Lee Lewis is a senior majoring in social work. Anthony R. Llamas is a sophomore majoring in nursing. Dylan Ray Lumpkins is a senior majoring in art (graphic design). Sydney Erin Luney is a freshman majoring in education. Nancy Marrs is a senior majoring in elementary education. Kathryn Grace Mason is a junior majoring in art. Adam Alexander May is a senior majoring in general studies (health promotion). Erin Elizabeth Pascal is a sophomore majoring in art (graphic design). Jonathan Ray Piszczek is a senior majoring in accounting. Jeremy Allen Robello is a junior majoring in management. Stephen Thomas Robertson is a junior majoring in management. Courtney Bryn Rorabaugh is a senior majoring in education. Kimmerly V. Rygg is majoring in education. Yvonne Josephine Sanders is a senior majoring in elementary education. Brianna Spexarth is a sophomore majoring in management. Chandra Stauffer is majoring in elementary education. Tajahnae Rayneisha Stocker is a freshman majoring in communication (public relations). Ryan Lee Swayne is a senior majoring in art education. Madison Ruth White is a freshman majoring in education. Amanda Wilson is a junior majoring in art. Liberal: Federico Jr Bernabe is a senior majoring in management (human resource). Liliana Bernabe is a senior majoring in management (human resource). Jhoselin Dominguez is a sophomore majoring in art (graphic design). Andres A. Escalante is a junior majoring in finance. Katherine Grac Hernandez-Barahona is a sophomore majoring in radiologic technology. Tuan Hoang Le is a junior majoring in management (human resource). Maira M. Regalado is a junior majoring in general studies (human services). Connie Lee Smalldridge is a senior majoring in elementary education. Eric Dean Volden is a senior majoring in sociology. Preston Cull Whisenant is a senior majoring in sociology. Topeka: Ellen Kristine Boeding is majoring in geology. Anthony James Brown is a senior majoring in elementary education. Jeanne Ann Burnett is a sophomore majoring in education. Bradley W. Carpenter is a junior majoring in marketing. Rachel J. Conley is a senior majoring in management (human resource). Dorcianna Cortez is a senior majoring in general studies (psychological). Megan Jo Dewerff is a senior majoring in communication sciences and disorders. Mallory Elizabeth Diederich is a senior majoring in mathematics. Lisa Ann Doty is a junior majoring in education. Jessica Brooks Greene is a senior majoring in elementary education. Stephany Carolyn Gress is a senior majoring in political science. Brenda Ann Hahn is a senior majoring in education. Shana Dyan Halloran is a sophomore majoring in information networking and telecommunications (computer networking). Christina Sue Hubbart is a junior majoring in education. Ashley Paige Hughes is a senior majoring in elementary education. Lewis Jacob Kemper is a senior majoring in music (music education). Scott Donald Langer is a senior majoring in business education (training and development). Kelly Marie Legleiter is majoring in elementary education. Kimberly Anne Meyers-Lopez is majoring in early childhood unified. Samantha M. Montgomery is a freshman majoring in biology (pre-medical and pre-dentistry). Justin Luke Montney is a junior majoring in health and human performance (exercise science). Jesse Joan Nioce is a senior majoring in management. Sarah Nicole Pimentel is a junior majoring in radiologic technology. Julie Prosser is a senior majoring in psychology. Briana Renee Rightmeier is a senior majoring in elementary education. Carrie Stead is a senior majoring in education. Joselyne Abigail Villa-Flores is a sophomore majoring in accounting. Hoxie: Samantha Leigh Brown is a freshman majoring in art (studio art). Randi Elise Cressler is a senior majoring in medical diagnostic imaging (ultrasound). Carly Marie Heim is a freshman majoring in education. Selden: Leea Marie Juenemann is a senior majoring in psychology. Jalyn Marie Shaw is a junior majoring in communication sciences and disorders. Goodland: Britney Lynne Brown is a sophomore majoring in social work. Cortney Nicole Cowan is a junior majoring in management. Kirsten M. Dutton-Lamb is a senior majoring in geology. Dana Lynn Fulcher is a senior majoring in early childhood unified. Michaela Y. Garrett is a senior majoring in justice studies. Gunner Dean Helton is a junior majoring in justice studies. Norelia M. Ordonez-Castillo is a junior. Cheyene Rose Prevatt is a freshman majoring in biology (pre-medical and pre-dentistry). Dax L. Ruhs is a sophomore majoring in biology (pre-occupational therapy). Hannah Arinne Sanderson is a sophomore majoring in information networking and telecommunications (media studies). Audrey R. Titus is a senior majoring in art (graphic design). Raquel Tomsic is a sophomore majoring in biology (education). Taylor Thane Tomsic is a senior majoring in psychology. Gaylord: Michaela Jenae Sasse is a senior majoring in biology (pre-medical and pre-dentistry). Kensington: Daniel Stephen Hill is a senior majoring in music. Lebanon: Joshua Michael McDowell is a senior majoring in justice studies. Smith Center: Hallie Rose McCall is a senior majoring in biology (pre-medical and pre-dentistry). Macksville: Adam Douglas Oak is a senior majoring in technology studies (construction management). St. John: Schuyler Lynn Brown is a junior majoring in health and human performance (sport and exercise therapy). Shane Fitzgerald Keller is a junior majoring in general studies (massage therapy). Johnson: Darbi Kae Cook is a freshman majoring in health and human performance. Quinn Robert Kendrick is a senior majoring in political science. Nickolas Ray Shironaka is a freshman majoring in health and human performance (fitness programming). Hugoton: Zane Littell is a junior majoring in chemistry. Chase W. Mills is a senior majoring in social work. Kara Jean Stump is a senior majoring in elementary education. Argonia: Alex Ryan Weiss is a senior majoring in health and human performance (sport management). Belle Plaine: Megan Oria Doyle is a senior majoring in elementary education. Sara Rose Doyle is a senior majoring in music (performance). Jamie Ann Wilkerson is a junior majoring in psychology. Mayfield: Karley Callender is a senior majoring in education. Mulvane: Samantha Ashton Booth is a senior majoring in psychology. Julia Marie Jarboe is a senior majoring in business education (training and development). Samantha M. Schmitz is a freshman. Wellington: Gracie Dawn Defore is a junior majoring in tourism and hospitality management. Brewster: Kasey Mae Hoyt is a senior majoring in education. Layton Wayne Werth is a freshman majoring in agriculture (agronomy). Colby: Kyle Mark Berkgren is a senior majoring in computer science. Barbara Lee Bickner is a senior majoring in music (music education). Katera Lynn Harter is a senior majoring in agricultural business. Lacy Joe O'Neal is a senior majoring in general science (biology). Jordan Wade Rasmussen is a senior majoring in management. Alexa Faye Schindler is a junior majoring in education. Haley Lorraine Stickel is a senior majoring in accounting (public). Caitlyn Anne Wark is majoring in general studies. Jessica Marie Wilson is majoring in accounting (public). Brook Ziegelmeier is a freshman majoring in health and human performance (sport management). Gem: Hailee Anne Spresser is a junior majoring in tourism and hospitality management. Jay Thomas Ziegelmeier is a sophomore majoring in agricultural business. Rexford: Kylie Kay Jones is a junior majoring in agriculture (animal science). Ogallah: Katelyn Christine Herl is a junior majoring in general studies (massage therapy). WaKeeney: Shaylee Jo Flax is a sophomore majoring in agriculture (animal science). John Michael Griffith is a junior majoring in marketing. Larissa Antionette Howard is a sophomore majoring in geology. Addie Lea Zeman is a junior majoring in nursing. Eskridge: Sami Lee Logan is majoring in business education (teacher licensure). Maple Hill: Anne-Sophie Clotilde Dalmasso is a freshman majoring in health and human performance (health promotion). Madeline Jane Muller is a freshman majoring in biology. Sharon Springs: Annabelle Lee Seader is a freshman majoring in social work. Wallace: April Marie Mays is a junior majoring in communication sciences and disorders. Weskan: Grace Alaine Purvis is a freshman majoring in art (graphic design). Clifton: Nathan Preston Schaefer is a junior majoring in history (secondary education). Linn: Jessica Lynn Bryant is a sophomore majoring in radiologic technology. Palmer: Kendra Dawn Bargman is a sophomore majoring in business. Washington: Jordanna Marie Beikman is a sophomore majoring in nursing. Rebecca Lyn Holsch is a sophomore. Emily Dawn Lucas is majoring in elementary education. Leoti: Nicole Alexis Fischer is a senior majoring in mathematics (teaching). Tamera Jean Geyer is a junior majoring in education. Clancy Lea Masterson is a senior majoring in elementary education. Marienthal: Tracey Lee Baker is a senior majoring in elementary education. Toronto: Amanda Kay Young is a senior majoring in psychology. Bonner Springs: Jenna Carlene Ast is majoring in elementary education. Erin Mills is a senior majoring in business education (corporate communication). Caleb Isaac Seaton is a senior majoring in technology studies (industrial). Edwardsville: Michaela Louise Krzesinski is a junior majoring in political science. Kansas City: Guadalupe Amairani Ceron-Lopez is a senior majoring in elementary education, honors. Tiffany M. Haynes is a sophomore majoring in education. Vilma Y. Maldonado is a senior majoring in management. Phi Thi Nguyen is a senior majoring in information networking and telecommunications (health information). Evan Michael Norris is a senior majoring in history (secondary education). Mariah E. Smith is a sophomore majoring in communication (public relations). Yolanda Marie Ronnau is a junior majoring in psychology. Helen Amanda Welsh is a junior majoring in sociology. Enterprise: Amber N. Fannin is a freshman majoring in education. Juneau: Christopher M. Cummings is a senior majoring in information networking and telecommunications (computer networking). Willow: Kelsey Renee Olson is a sophomore majoring in nursing. Gilbert: Claudia Adriana Vazquez is a senior majoring in nursing. Glendale: Shea Mackenzie Bonine is a sophomore majoring in biology (pre-physical therapy). Mesa: Michael Ross Ford is a junior majoring in information networking and telecommunications (computer networking). Gina Marie Williams-Janes is a sophomore majoring in education. Phoenix: Aleata Marie Dinsmoore is a junior majoring in justice studies. Surprise: Kylie Marie Strand is a senior majoring in health and human performance (health promotion). Black Rock: Roy Stanley Gott is a senior majoring in education. North Little Rock: Jessica Lynn Poppy is a senior majoring in information networking and telecommunications (Web development). Adelanto: Raiden Jace Martinez is a junior majoring in general studies (criminal justice). Carmichael: Juliana Grace Mamola is a junior majoring in general studies. Encino: Andrea Jamiel is a senior majoring in psychology. Fairfield: Keshia Craig is majoring in information networking and telecommunications (computer networking). Anwar M. Hugais is a junior majoring in organizational leadership. Glendale: Shawn Michael Bush is a senior majoring in psychology. Hemet: Jessica Kimberly Klauk is a senior majoring in education. Lompoc: Christopher John Gray is a senior majoring in management information systems. Morro Bay: Holly Anne Brown is a senior majoring in management (human resource). Murrieta: Sean M. Degrave is a senior majoring in organizational leadership. Pasadena: Alexander Daniel Mendez is a senior majoring in information networking and telecommunications (computer networking). Petaluma: Noemi Gonzalez is a junior majoring in justice studies. Pleasanton: Michaela M. Hertle is a senior majoring in political science. Porterville: Andrea Rosso is a junior majoring in psychology. Roseville: Kevin Michael Stewart is a senior majoring in medical diagnostic imaging. Sacramento: Windy Christina Bouldin is a sophomore majoring in organizational leadership. Champagne Mercedes Clark is a sophomore majoring in psychology. San Diego: Kelley Marie Bernard-James is a senior majoring in management. Santa Rosa: Abigail Marie Groth is a freshman majoring in nursing. Arapahoe: Jael Leah Myers is a senior majoring in general science (biology). Aurora: Juana Guadalupe Estrada-Hernandez is a senior majoring in art education. Breckenridge: Anna Marie Wilson is a sophomore majoring in nursing. Broomfield: Jasmine Theresa Beaulieu is a sophomore majoring in psychology. Ashley Nicole Clark is a junior majoring in marketing. Brush: Erin Leigh Berg is a senior majoring in elementary education. Kristina Amy Davis is a senior majoring in justice studies. Yajayra Hinojos is a freshman majoring in social work. Mauri Ann Lundquist is a freshman majoring in medical diagnostic imaging (ultrasound). Burlington: Kerrie Allacher is a senior majoring in art (graphic design). Kristin Kay Allacher is a senior majoring in English (writing). Calhan: Kaley Lore Lefever is a senior majoring in nursing. Mariam Alexandra Sears is a junior majoring in radiologic technology. Canon City: Elizabeth Ann Ary is a senior majoring in history (secondary education). Castle Rock: Kirsten Riley Shriver is a sophomore majoring in psychology. Centennial: Danielle Nichole Harris is a senior majoring in psychology. Cheyenne Wells: Kenli Shea Roth is a sophomore majoring in nursing. Colorado Springs: Jessica Louise Buxton is a sophomore majoring in organizational leadership. Katherine Scarlett Chambers is a senior majoring in psychology. Karissa Gonzalez-Othon is a senior majoring in art. Ella Alexandria Ingram is a sophomore majoring in communication (organizational). Brett Richard McFarland is a sophomore majoring in technology leadership. Lucille Grace Partlow-Loyall is a sophomore majoring in social work. Alexis-Athena Steva Wyatt is a freshman majoring in English (teaching). Dacono: Nathan Curtis Harrison is a junior majoring in athletic training. Denver: Jade Catalina Singleton-Reich is a senior majoring in organizational leadership. Eads: Marisa Lee Dixon is a senior majoring in health and human performance (sport management). Elbert: Reilly Kate Franek is a freshman majoring in political science. Benjamin Tyler Williams is a senior majoring in music (music education). Elizabeth: Cheney Rachelle Rutherford is a senior majoring in justice studies. Jessica Parker Schmidt is a senior majoring in education. Evergreen: Jared Tadlock is a senior majoring in art (studio art). Falcon: Matthew Monroe Frazier is a freshman majoring in information networking and telecommunications (Web development). Firestone: Stephanie Anne Myers is a junior majoring in education. Flagler: Aubree Anne Petty is a sophomore majoring in health and human performance. Fort Collins: Taylor Renee Mares is a senior majoring in accounting. Highlands Ranch: Nicole Scheuerman is a sophomore majoring in psychology. Lauren Nicole Solzman is a senior majoring in tourism and hospitality management. Rachel Michelle Szczepanski is a junior majoring in biology (pre-physical therapy). Kim: Tai Ann Nittler is a senior majoring in social work. La Junta: Lenea Renee Ortiz is a senior majoring in elementary education. Lakewood: Austin James Foster is a junior majoring in management. Austin Grogan is a sophomore majoring in information networking and telecommunications (computer networking). Lamar: Alexandra Maireen Wurst is a senior majoring in accounting. Limon: Ashley Jo Roth is a senior majoring in finance. Littleton: Ember M. Albertson is a senior majoring in psychology. Stephani Lynn Fowler is a sophomore majoring in psychology. Andrea Marie Nimz is a freshman majoring in medical diagnostic imaging (ultrasound). Brette Morgan Wallis is a sophomore majoring in health and human performance (fitness programming). Lone Tree: Kristin Conor is a junior majoring in marketing. Longmont: Kailey Nanette Klibbe is a freshman majoring in education. Megan Ann Thompson is a junior majoring in elementary education. Alicia Nicole Vigil is a senior majoring in early childhood unified. Loveland: Veronica Kim Peiffer is a sophomore majoring in marketing. Samantha Paige Villarreal is a junior majoring in general studies (education). Monument: Randi Marie Nielsen is a junior majoring in art. Parker: Jennifer Lynn Dolan is a senior majoring in philosophy. Alexis Nicole Hansen is a junior majoring in nursing. Kaley Alexa Jamnik is a senior majoring in art. James Thomas Kadolph is a junior majoring in history (secondary education). Nathan Emmett Purdue is a senior majoring in chemistry (teacher education). Peyton: Derek Charles Baumann is a sophomore majoring in technology studies (construction management). Minda Jean Smith is a senior majoring in marketing. Pueblo West: Adam D. Selfridge is a junior majoring in psychology. Aimee Selfridge is a junior majoring in psychology. Strasburg: Rilee Marie Krier is a senior majoring in computer science. Thornton: Sharron Alissa Sedbrook is a senior majoring in organizational leadership. Westminster: Jacob Woodrow Abbas is majoring in psychology. Simone Katherine Clement is majoring in psychology. Luke Alexander Edney is a senior majoring in justice studies. Wiggins: Terran Wayne Freauff is a sophomore majoring in geography. Woodland Park: Drew Garrett Bealby is a sophomore majoring in geosciences. Wray: Paulyna M. Alcorn is a sophomore majoring in biology (cellular-molecular). Romario Pureco-Diaz is a junior majoring in agriculture (agronomy). Middletown: Alison Ann Dunbar is a sophomore majoring in International business and economics. New Castle: Robert L. Murray is a freshman majoring in information networking and telecommunications (computer networking). Brandon: Patrick Augustin is a senior majoring in information networking and telecommunications (computer networking). Cocoa Beach: Marykate Cartwright is a senior majoring in psychology. Crestview: Cheryl La Thomas is a senior majoring in sociology. Deleon Springs: Daniel Jacob Farrell is a senior majoring in political science. Fort Lauderdale: Jaimee Otton is a junior majoring in education. Hudson: David Gregory Carroll is a junior majoring in organizational leadership. Jacksonville: Cara M. Doerr is a junior majoring in psychology. Carly M. Weeks is a junior majoring in business education (teacher licensure). Key West: Siranna Marie Williams is a senior majoring in psychology. Kissimmee: Kirsten Cruz is a senior majoring in psychology. Lake Worth: Helene Previl is a senior majoring in general studies (political). Lehigh Acres: Hannah Perez is a freshman majoring in general studies. Miami: Leslie Alfonso is a senior majoring in education. Naples: Edwardo Torres is a sophomore majoring in psychology. Niceville: Anne Marie Melia is a senior majoring in general studies (psychological). Orange Park: Timothy O. Lee is a junior majoring in psychology. Sarasota: Alicia Kay Gaston is a senior majoring in psychology. Braselton: Amanda Collins Wadford is a senior majoring in medical diagnostic imaging. Dacula: Laura Kay Johnson is a junior majoring in management. Hazlehurst: David Matthew Herndon is a senior majoring in sociology. Jasper: Nhung T. Tucker is a senior majoring in psychology. Mansfield: Kevin Christopher McMichael is a freshman majoring in psychology. Kailua: Jared Devern Kerr is a senior majoring in technology leadership. Idaho Falls: Stephanie Elizabeth McGrail is majoring in early childhood unified. Chicago: Aalia Jahaan Abdullah is a junior majoring in education. Evergreen Park: Samantha Aalders is a senior majoring in information networking and telecommunications (computer networking). Minooka: William Lee Fox is a senior majoring in International business and economics. O Fallon: Krista Marie Robbs is a junior majoring in psychology. Oak Forest: Alicia Solis is a senior majoring in psychology. Peoria: Nisreen R. Musaitif is a junior majoring in management. Plainfield: Rhonda S. Konrath is a senior majoring in general studies (psychological). Cynthia R. Trautz is a senior majoring in management. Romeoville: Marinel Mendoza is a senior majoring in sociology. Indianapolis: Adia Gracie Ahmed is a senior majoring in management information systems. Warsaw: Michael Robert Yantz is a senior majoring in finance. Akron: Joni Ann Noble is a freshman majoring in general studies. Council Bluffs: Heather Marie Wobbema is a junior majoring in management. Davenport: Zachary Donald Smith is a senior majoring in general studies (general business). Marion: Mary Elizabeth McDermott is a senior majoring in art (graphic design). Elizabethtown: Phyllis Elaine Nichols is a junior majoring in psychology. Louisville: Chad W. Carson is a senior majoring in psychology. Arnaudville: Tara Morgan is a junior majoring in psychology. New Orleans: Jordan Jackson Wofford is a freshman majoring in information networking and telecommunications (computer networking). South China: Kristy Quimby is a freshman majoring in justice studies. Boonsboro: Shannon L. Barry is a sophomore majoring in psychology. Frederick: Somphaphone Laos Kakhankham is a senior majoring in information networking and telecommunications (Web development). Frostburg: Nicholas Joseph Costello is a senior majoring in justice studies. Severn: Anita Dunklin is a senior majoring in business education (training and development). Gloucester: Kevin Jeffrey Haines is a sophomore majoring in philosophy. Annandale: Heather Ann Peters is a junior majoring in psychology. Bemidji: Benjamin Andrew Pope is a senior majoring in organizational leadership. Blue Springs: Cynthia G. McPeek is a senior majoring in medical diagnostic imaging. Columbia: Michael James Palmer is majoring in psychology. Gladstone: Haley B. Corkill is a senior majoring in communication sciences and disorders. Golden City: Denise Ruth Powell is a junior majoring in elementary education. Goodson: Brooklynn Fuller is a freshman majoring in psychology. Grain Valley: Sarah Lynn Ray is a senior majoring in psychology. House Springs: Jackson Douglas Bjornstad is a junior majoring in technology studies (education). Kansas City: Andrea Lynn Hunnicutt is a sophomore majoring in general studies. Tiffany Marie Johnson is a senior majoring in justice studies. Kaley Kristine Nicholson is a junior majoring in social work. Lee's Summit: James Patrick Kennedy is a sophomore majoring in information networking and telecommunications (health information). Aaron John Shockey is a senior majoring in information networking and telecommunications (computer networking). O'Fallon: Seth Matthew Parres is a senior majoring in health and human performance (sport and exercise therapy). Rushville: Rebecca Jo Parsons is a junior majoring in general studies (human services). Smithville: Jamie Sue Svatos is a junior majoring in psychology. Verona: Sabrina Kathleen Brant is a sophomore majoring in general studies. Missoula: Jeremy Jacob Treib is a senior majoring in general studies (networking). Alma: Abigail L. Artz is a junior majoring in English (literature). Aurora: Nathan Edwin Dozier is a freshman majoring in music (theory and composition). Beatrice: Jill Nicole Faxon is a junior majoring in health and human performance (K-12 teaching and coaching). Beaver City: Emily Ann Becker is a sophomore majoring in art. Samuel Dean Hunt is a freshman majoring in agricultural business. Benkelman: Elizabeth E. Earnest is a junior majoring in art (graphic design). Brady: Dakota Jo Terry is a junior majoring in education. Cambridge: Joel R. Stagemeyer is a senior majoring in agriculture. Cozad: Bryce Stephen Nemeth is a freshman majoring in biology (pre-medical and pre-dentistry). Dwight: Beth Ann Bohuslavsky is a senior majoring in elementary education. Friend: Taylor Catherine Menke is a sophomore majoring in medical diagnostic imaging. Grand Island: Jordan A. Gross is majoring in medical diagnostic imaging (ultrasound). Hastings: Brittany Nicole Ballou is a senior majoring in business education (teacher licensure). Mariah Dawnae Deepe is a senior majoring in organizational leadership. Sarah K. Jarmer is a junior majoring in English (teaching). Alaethea Nicole Remmers is a junior majoring in communication sciences and disorders. Holdrege: Shai Monica Christensen is a sophomore majoring in art. Rachel Elizabeth Robinson is a senior majoring in art (studio art). Andrew Clark Stroh is a freshman majoring in justice studies. Imperial: Shelby Lee Jaeger is a sophomore majoring in management. Lincoln: Clay W. Barton is a junior majoring in management (human resource). Hannah L. Jurgens is a junior majoring in health and human performance (sport management). Madison T. Schwartz is a senior majoring in art. Robert Connor Shedeed is a sophomore majoring in justice studies. McCook: Luke Richard Lichty is a freshman majoring in health and human performance (health promotion). Bryce Lyons is a freshman majoring in agricultural business. Clayton Michael Skolout is a junior majoring in agricultural business. Omaha: Talia Lynne Frank is majoring in education. Sarah Jessica Martin is a senior majoring in education. Mclaine Patrick Whalen is a senior majoring in technology studies (industrial). Oxford: Austin Wayne Krejdl is a freshman majoring in agricultural business. Paxton: Kyle Preston Storer is a junior majoring in agricultural business. Ravenna: Cortney M. Sonnenfeld is a sophomore majoring in art education. Raymond: Callie June Christensen is a sophomore majoring in International business and economics. Scottsbluff: Ashley Rose Harimon is a sophomore majoring in nursing. Seward: Jordan Douglas Troester is a senior majoring in radiologic technology. Superior: Victoria Rose Hatzenbuehler is a junior majoring in education. Fallon: David Ancil May is a senior majoring in management information systems. North Brunswick: Katelyn Mattei is a sophomore majoring in psychology. Tijeras: Grant Connor Storey is a junior majoring in tourism and hospitality management. Bronx: Samantha Dorn is a freshman majoring in tourism and hospitality management. Corona: Vitaly Valentine is a sophomore majoring in organizational leadership. Lisbon: Ernest Richard Hohensee is a sophomore majoring in psychology. Oswego: Melody Mary Cappello is a junior majoring in information networking and telecommunications (Web development). Yonkers: Barrie Jason Roer is a freshman. John Joseph Sikora is a junior majoring in general studies. Cameron: Melanie White is a senior majoring in psychology. Charlotte: Rickey Hall is a senior majoring in psychology. Concord: Sarah Elizabeth Ledbetter is a junior majoring in justice studies. Fayetteville: Yusef Aukie Roberson is a senior majoring in general studies. Huntersville: Amelia Rae Burnette is a senior majoring in general studies (criminal justice). Indian Trail: Sharon Hendrickson Campbell is a senior majoring in general studies (psychological). Mount Pleasant: Kathryn Elizabeth Jacobs is a senior majoring in psychology. Randleman: Randy Scott Laws is a junior majoring in education. Tarawa Terrace: Erin Kay Brooks is a sophomore majoring in general studies. Barberton: Mercede N. Seigfried is a sophomore majoring in psychology. Bellbrook: Mary Lassena Wilson is majoring in justice studies. Boardman: Taunza V. Haynes is a sophomore majoring in management (human resource). Canfield: Kristen Nicole Stahl is a junior majoring in psychology. Canton: Brittany Warren is a junior majoring in psychology. Cleveland: Michael David Freedman is a senior majoring in general studies. Findlay: Brookelynn Michele Diaz is a senior majoring in psychology. Grove City: Jeffrey D. Grimm is a junior majoring in sociology. Jackson: Elisha Denee Smith is a senior majoring in early childhood unified. Piqua: Carrie Nichole Johnson is a senior majoring in psychology. Beaver: Melissa Dawn Taylor is a senior majoring in elementary education. Broken Arrow: Courtney Nichole Dobson is a senior majoring in health and human performance (K-12 teaching and coaching). Choctaw: Alina Alonso is a senior majoring in psychology. Enid: Matthew Sullivan Blakley is a senior majoring in geology. Guymon: Garrett Jake Messenger is a senior majoring in geography. Kingston: Britney Skylene Bogue is a junior majoring in sociology. Midwest City: Christina Sibley is a sophomore majoring in health studies. Moore: Erin Elizabeth Elmore is a senior majoring in biology (pre-physical therapy). Muldrow: Thomas Kidd is a freshman majoring in management information systems. Muskogee: Shelbi K. Taylor is a senior majoring in education. Mustang: Brittany Renee Caffey is majoring in elementary education. Norman: Betty Marie Chagaris is a sophomore majoring in education. Brent Jewell is a senior majoring in general studies (human services). Lindsay Marie Schemm is majoring in elementary education. Oklahoma City: Mckinsey Ann Basinger is a junior majoring in sociology. Oologah: Brinley Renee Evans is a sophomore majoring in biology (pre-medical and pre-dentistry). Poteau: Trevor Judah Shankle is a junior majoring in history. Quapaw: Zachary Tyler Bacon is a junior majoring in health and human performance (K-12 teaching and coaching). Yukon: Karissa Janea Langlois is a senior majoring in justice studies. Beaverton: Quinn Mackenzi Terry is a senior majoring in organizational leadership. Oakland: Jessica Ann Wagoner is a freshman majoring in general studies (health promotion). Salem: Bonnie Poole is a junior majoring in political science. Shady Cove: Julie Kate Buchanan is a senior majoring in general studies. Springfield: Stinna Lee Karch is a senior majoring in general studies (health promotion). Altoona: Trenton Donall Watson is a sophomore majoring in information networking and telecommunications (computer networking). Beaver: Madeline McGee is a junior majoring in general studies (historical). Center Valley: Seamus Eck is a sophomore majoring in psychology. Fayetteville: Chantelle Bakner is a senior majoring in elementary education. Philadelphia: Felix Cruz is a senior majoring in information networking and telecommunications (Web development). Pittsburgh: Michael Joseph Pride is a senior majoring in psychology. Bayamon: Christian A. Gonzalez-Martinez is a freshman. Naguabo: Edgar Almodovar is a junior majoring in psychology. Vieques: Tiann Fields is a freshman majoring in sociology. Beaufort: Angela Whidby Scheidt is a senior majoring in education. Conway: Gregory Alan Johnson is a senior majoring in technology leadership. Goose Creek: Deena K. Gamble is a senior majoring in medical diagnostic imaging. Johns Island: Erik B. Wilsgard is a sophomore majoring in International business and economics. Mount Pleasant: Beth Ann Breitinger is a senior majoring in management (human resource). Watertown: Lorie A. Brunner is a freshman. Bedford: Mirela Tea Hamidovic is a sophomore majoring in general studies. Belton: Charlie L. Vonstaden is a junior majoring in general studies. Cypress: Andrew Maranga Ratemo is a senior majoring in International business and economics. Dallas: Josie Berg is a junior majoring in International business and economics. Fort Worth: Deanna Christine Pierce is a junior majoring in psychology. Houston: Dolly Linda Aggrey is a senior majoring in nursing. Kouassi Akon Ebrottie is a senior majoring in nursing. Joshua: Kelly Musgraves is a senior majoring in general studies. Katy: Xylliikwa Victoria Tillman is a senior majoring in psychology. Longview: Shannan Elizabeth Turner is a senior majoring in psychology. McKinney: Vianei Ariana Sanchez is a junior majoring in accounting. Mesquite: Kathryn Therese Leos is a junior majoring in health and human performance (K-12 teaching and coaching). Perryton: Brenda L. Castro is a senior majoring in medical diagnostic imaging. Richardson: Courtney Michelle Morgan is a freshman majoring in psychology. Round Rock: Michael Travis Cole is a senior majoring in health and human performance (sport and exercise therapy). Jamie Rae Smith is a senior majoring in psychology. Wimberley: Meagan Courtney Buck is a senior majoring in general studies (education). Helper: Stephanie Margaret Asay is a junior majoring in tourism and hospitality management. Ogden: Krista Danielle Haney is a senior majoring in elementary education. Spanish Fork: Gina K. Jarvis is a sophomore majoring in information networking and telecommunications (Web development). Grundy: Kamil Pietras is a sophomore majoring in International business and economics. Strasburg: Golda Lee Albert is a sophomore majoring in tourism and hospitality management. Surry: Bailey Amanda Mortimer is a senior majoring in psychology. Virginia Beach: Jessica Ryder is a junior majoring in psychology. Sara Elizabeth Standring is a senior majoring in psychology. Olympia: Basil Ryen is a sophomore majoring in information networking and telecommunications (Web development). Menomonie: Daniel Eugene Soler is a senior majoring in justice studies. Milwaukee: Jessica C. Lieske is a junior majoring in psychology. Sun Prairie: Celia Elise Zeinert is a junior majoring in general studies (human services). West Allis: Brandon William Zeck is a freshman. Nassau: Michael Keith Robinson is a freshman majoring in accounting. Chilliwack: Steven Kenneth Federau is a senior majoring in general studies (biological). Edmonton: Kevin Stanley Czarnecki is a senior majoring in health and human performance (gerontology). Beijing: Mingyang Sun is a freshman. Wanyue Xu is a freshman. Hong Kong: Daniel Hestevold is a sophomore majoring in organizational leadership. Lanzhou: Min Chen is a senior majoring in general studies. Lintong: Wujiang Zhao is a senior majoring in general studies. Mizhi: Chaoyue Zhao is a senior majoring in music (music technology). Shenyang: Cui Meng is a junior majoring in political science. Yuejia Qian is a sophomore majoring in organizational leadership. Yinchuan: Ruina Sun is a senior majoring in general studies. Yulin: Fangfang Xu is a senior majoring in general studies. Santo Domingo: Daniela Buttini is a freshman majoring in marketing. Frankfurt Am Main: Nadine I. Baier is a junior majoring in sociology. Ayer Tawar: Caleb Huei Quay is a senior majoring in general science. Cheras: Sabrina Fatimah Abdullah is a freshman majoring in psychology. Lagos: Obianuju Tobechukwu Ibe is a freshman majoring in nursing. Oluwakemi Lawal is a senior majoring in biology (pre-medical and pre-dentistry). Chukwuemeka Williams Njoh-paul is a senior majoring in biology (pre-medical and pre-dentistry). San Antonio: Flavius Cristian Garmacea is a junior majoring in organizational leadership. Dawadmi: Waleed Mohammed Alyahya is a sophomore majoring in information networking and telecommunications (computer networking). Jeddah: Mohammed Omar Mokhasheen is a junior majoring in information networking and telecommunications (computer networking). Madinah: Abdullah Mansour Alharbi is a senior majoring in information networking and telecommunications (computer networking). Riyadh: Rayan M. Almubayrik is a senior majoring in information networking and telecommunications. Ali A. Alsaeed is a sophomore majoring in information networking and telecommunications (computer networking). Abdulmohsen Khaja is a freshman majoring in political science. Busan: Minjoo Lee is a freshman. Gang Dong-Gu: Gyuseung Hwang is a sophomore. Seoul: Kwanghyun Kim is a freshman. Hyunsoo Lee is a freshman. Yuneil Yeo is a sophomore. Sungnam: Myungsoo Go is a freshman.